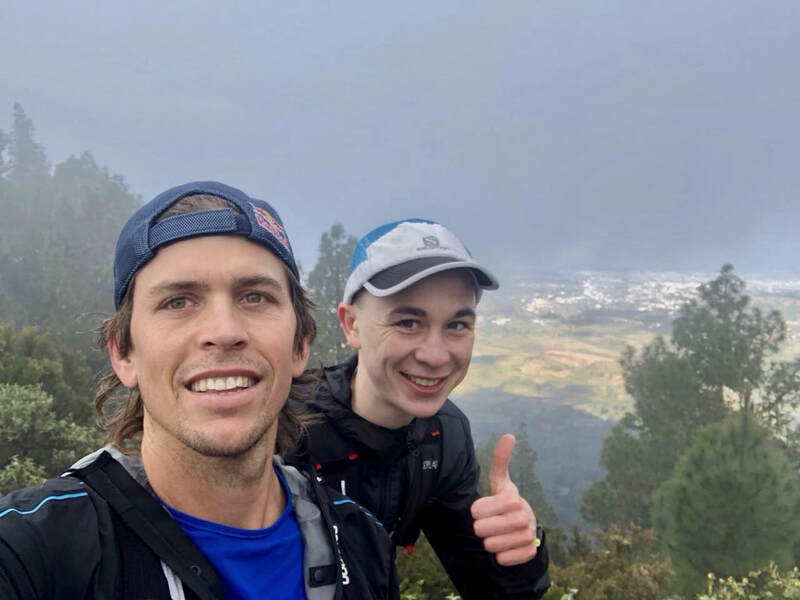 One month after making his major international debut at the Transvulcania 74K Ultramarathon in May on Spain’s La Palma Island, Patrick Caron – a native of Needham, Mass., and professional runner for Salomon – returned to Europe to once again test himself against a talented international field. 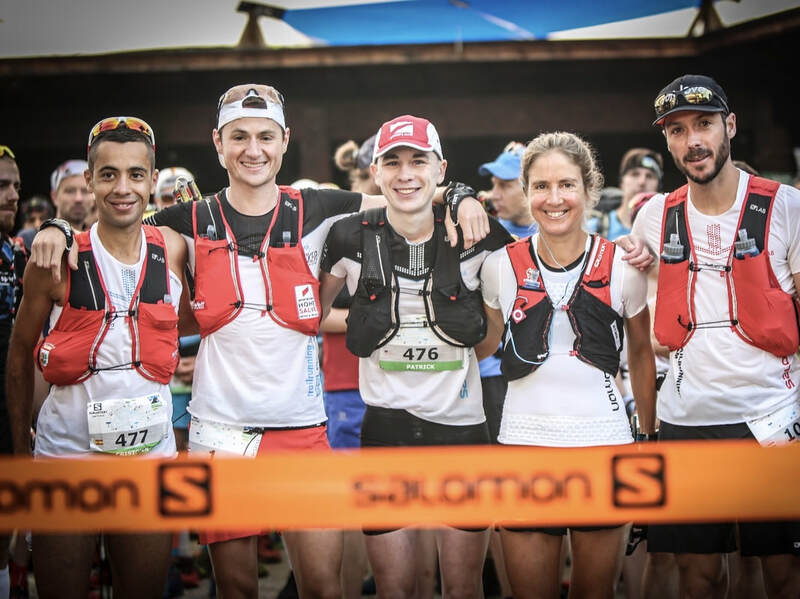 This time the destination was Germany on Saturday, June 16, for the Salomon Zugspitz Ultratrail – a 101.9-kilometer race with nearly 18,000 feet of vertical. 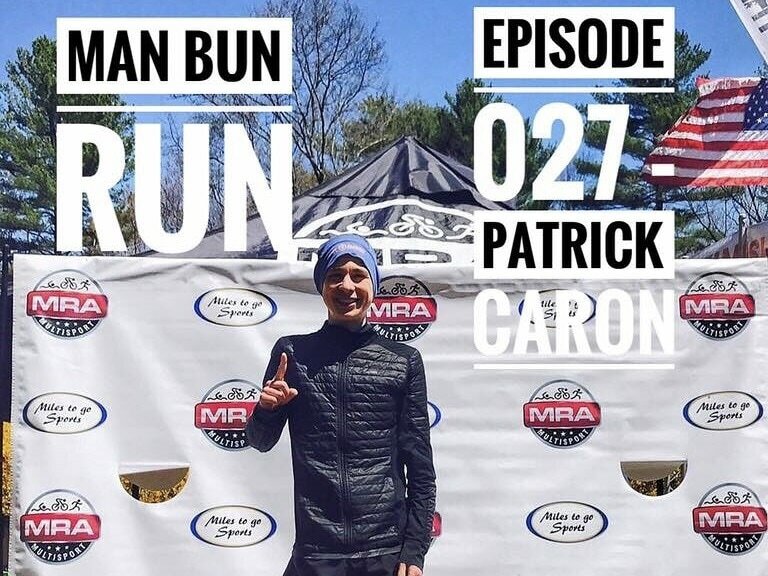 Ever since he burst onto the ultrarunning scene in September 2015 as a precocious 18-year-old at the TARC Fall Classic 50-miler, many in New England wondered how long it would take for Patrick Caron to showcase is talent on a larger stage. YP has been up to a lot of things late, including racing in Spain (we'll let him tell you that story) and serving as race director for the Boston Bulldogs Run for Recovery and Tribute. 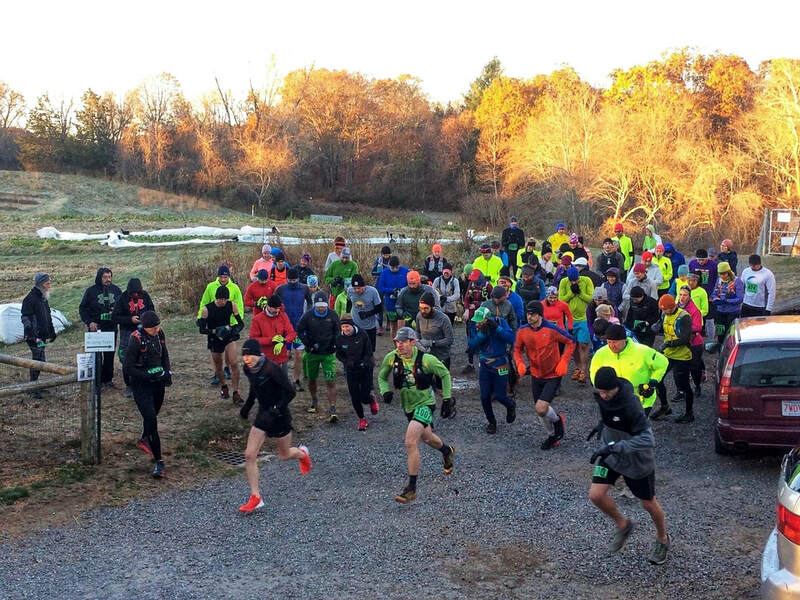 This years event, a 5K XC race in Franklin Park, saw a record crowd come out. 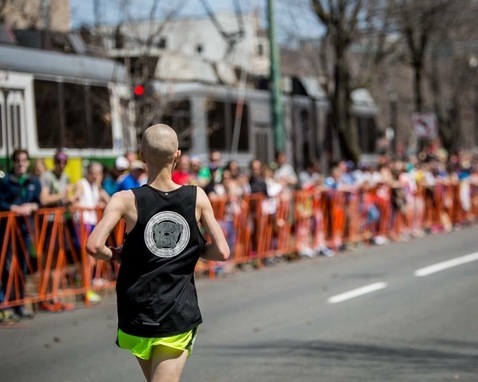 If you're not familiar with the Boston Bulldogs, they're a running club dedicated for people in recovery from addiction and their families. A great idea, a great race and a really good day. Congrats YP! 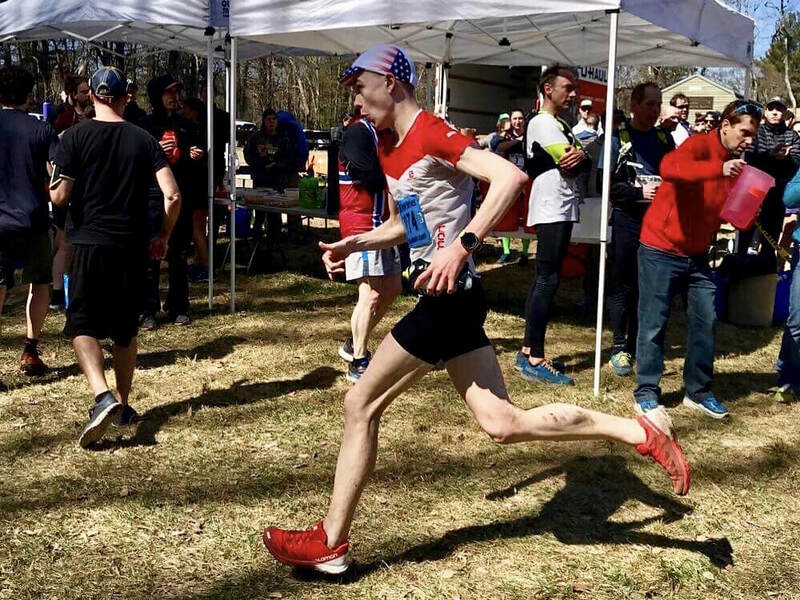 Fresh off of running a rain-soaked Boston Marathon on Monday, Patrick Caron shook out his legs with his second marathon of the week – this time on trail – at the Spring Classic. The 20-year-old from Needham, Mass., had plenty of speed left in his legs. He threw down the fastest marathon in Spring Classic history, and he did so by a large margin. Caron blazed to a winning time of 3:08:13, surpassing Michael King’s old course record of 3:27:38 from 2017. Caron’s closest competitor, 25-year-old Luke Plummer of Medford, Mass., was a distant second in 3:49:10, followed closely by Ed Cullen, 30, of Rumford, R.I., in 3:50:23, and Greg Esbitt, 44, of Ipswich, Mass., in 3:51:24. Have you ever wanted to go on a run with NETT superstar Patrick Caron but don't think you can keep up (can any of us, really?) Well, take a look at this VERY cool video of Patrick running the Piper Trail on Mt. Chocoura in New Hampshire as filmed by Ian MacLellan. Fiore’s pursuit of Langevin ultimately propelled him to a strong finish. 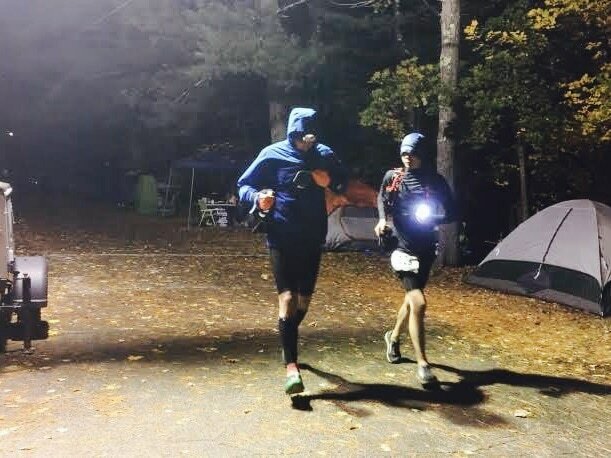 Both completed 34.1 miles, with Langevin – who has victories at the Riverlands 100, TARC Summer Classic 50K, Trust Trail Fest Marathon and Big Brad Ultras 50-Miler to his credit this year – finishing a few minutes ahead of Fiore for second place. Fiore was third. Caron successfully defended his title and broke his own course record by completing 40.3 miles. Caron ran 37.2 miles in 2016. 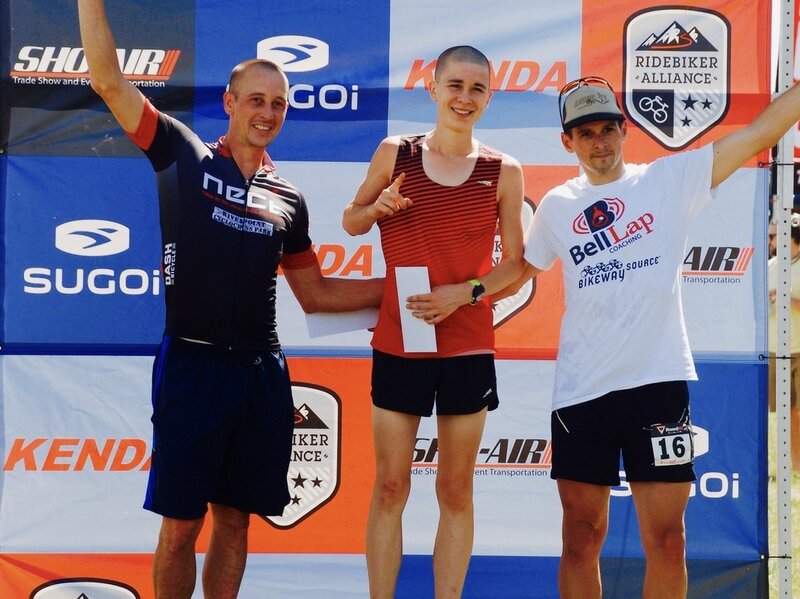 ...another NETT runner turned the ultra running world on its head recently by running the second-fastest 100 miler in the country this year--at only 20 years old! 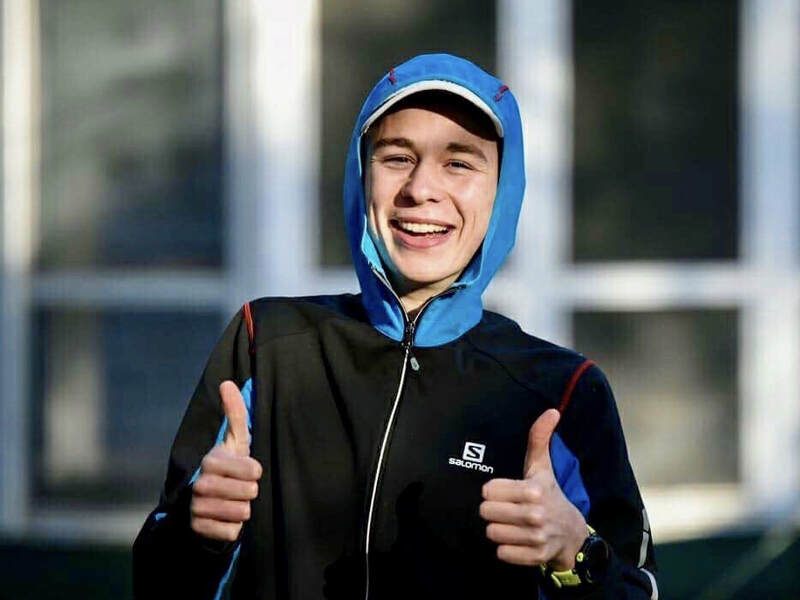 Yes, Young Patrick shattered his own record and ran what is currently the third fastest 100 miler in the WORLD this year finishing the Ghost Train Trail Race in 13:50. For 100 miles. We're so psyched for both of these guys since they're both kickass runners but also stand-up guys. Just what NETT is all about. Caron had just run one of the fastest 100-mile performances in the world for 2017. On this episode of the East Coast Trail and Ultra podcast we talk about trekking poles, when to use them and how to train with them. We also talk to Patrick Caron about his amazing run at the Ghost Train that saw him finishing 100 miles in 13:50:43. I really think Patrick is going to be a huge star in the sport and he has a great sense of humor as we go off topic a bit talking Pokemon Go and Halloween. Enjoy! Patrick Caron just ran the 3rd fastest 100 miler in the world for 2017. He’s 20, has big plans for his future, a positive outlook, super quick lets, and a pretty solid head on his shoulders. Patrick is the high school kid who scored straight A’s, but is passing on college. Unsure what he’ll be doing in two years, but has a running streak planned that lasts forty four years. Patrick wants to run everything, but has a hard time choosing one race he’d like to target. Here’s his ultrasignup. What were you doing when you were 20? Running an average of 16 miles/day? Volunteering for a 501(c)3 to help those affected by addiction? Patrick is doing this along with trying to find a way to make a living in this silly sport of ours and we have a good talk about becoming a professional ultrarunner in the digital age. 2017 Ghost Train Rail Trail Race Winner Patrick Caron Interviewed by Josh Katzman. Caron ran away from the field, defended his title and in doing so broke his own course record with a winning time of 6:58:11. Caron entered the race with a goal of breaking seven hours, a feat no runner had previously accomplished at the Fall Classic. He set out at a fast pace and spent most of the day running solo, save for moments when he lapped runners on the loop course. “For me, it was a nice mental boost knowing I ran this year’s race several minutes faster than last year’s, in non-ideal conditions, and that I did so while running alone for the entirety of the race,” Caron said. Fresh off of a flight home from Yellowstone National Park the day before, Patrick Caron shook off the jet leg by rocketing through the Ragged 50K course on Sunday, Aug. 13, in Danbury, N.H.
Caron, 20, of Needham, Mass., was the lone runner out of 96 finishers to complete the course in less than five hours. Starting at Mt. 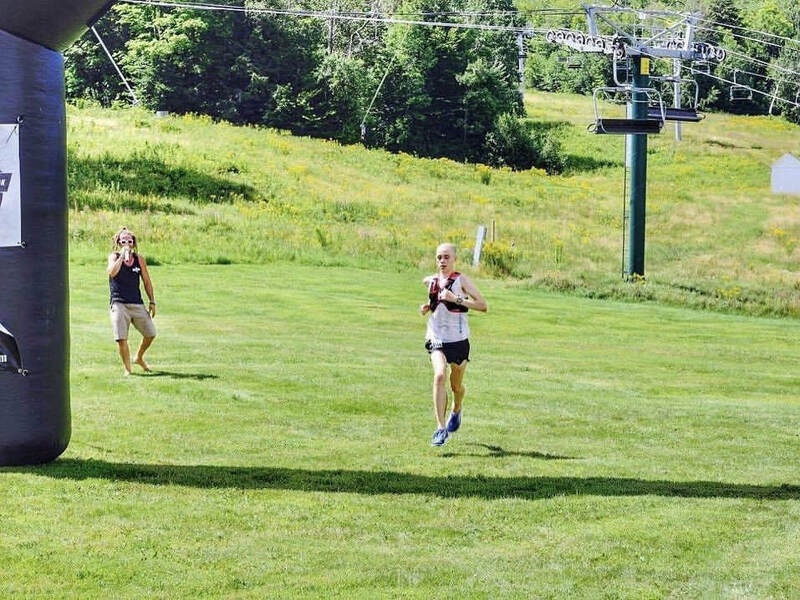 Sunapee, runners covered approximately 33 miles and climbed more than 6,000 feet while making their way to the finish line at Ragged Mountain Resort. 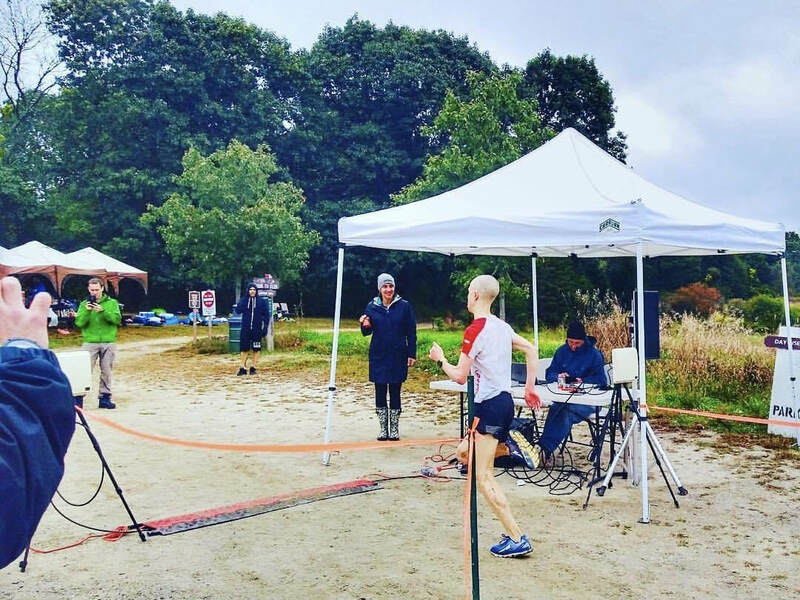 Caron hammered out a 4:53:26 to win the race and also secure the USATF-New England 50K Championship. 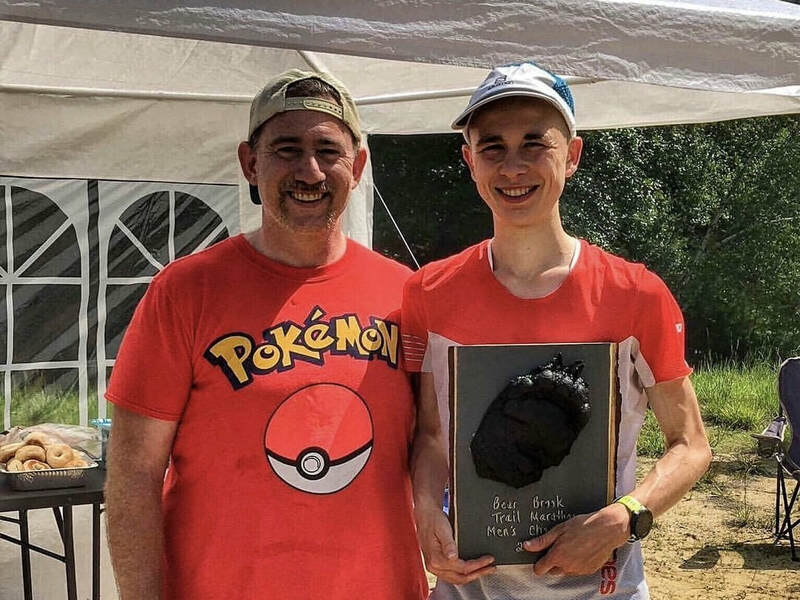 The sixth annual Bear Brook Trail Marathon took place Saturday, July 8, at Bear Brook State Park in Allenstown, N.H., and the top men’s and women’s finishers were Massachusetts ultrarunners. Patrick Caron and Lisa Rising brought home victories. Caron, 20, of Needham, ran away from the field and won by a hefty margin in 4:16:02. 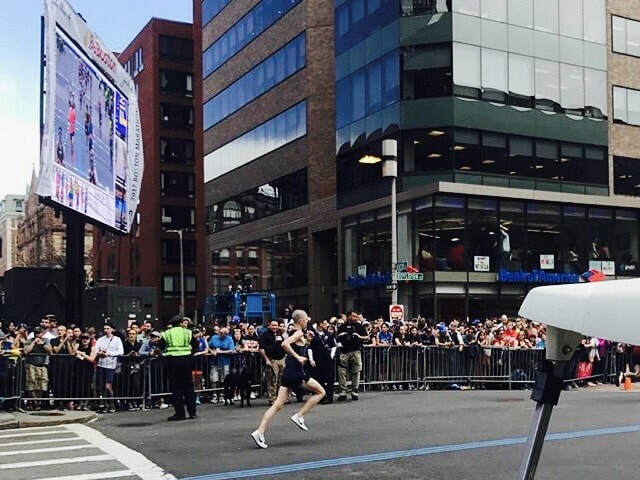 The 50-mile race featured runaway performances by the speediest men, as well as a close battle among the top women who were separated by seconds – and Massachusetts residents earned the top two spots in both categories. 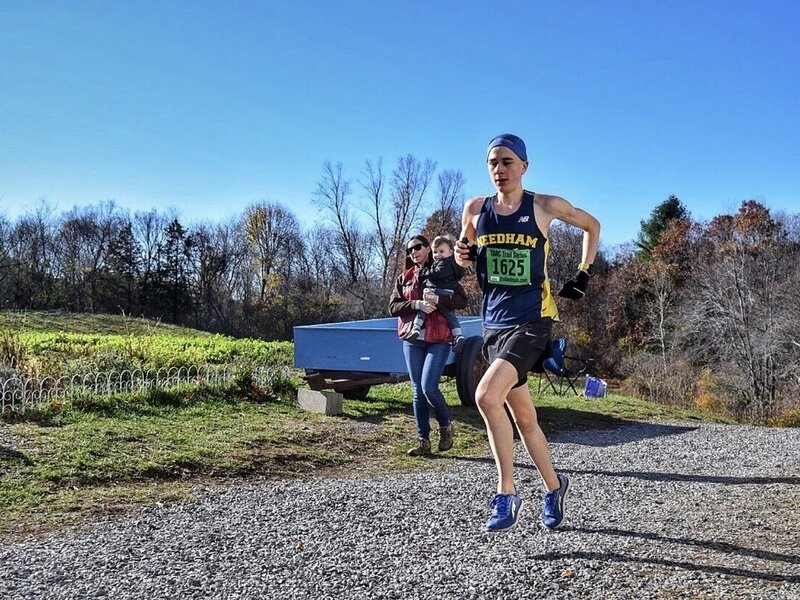 A few weeks out from a trip to Austria to take part in the Salomon Running Academy, 20-year-old Patrick Caron of Needham, Mass., returned to Pineland Farms to attempt to defend his 50-mile title. Caron spent the day on cruise control, first circling the 3.5-mile mini loop and then covering the 25K mini loop three times while gradually building his lead. 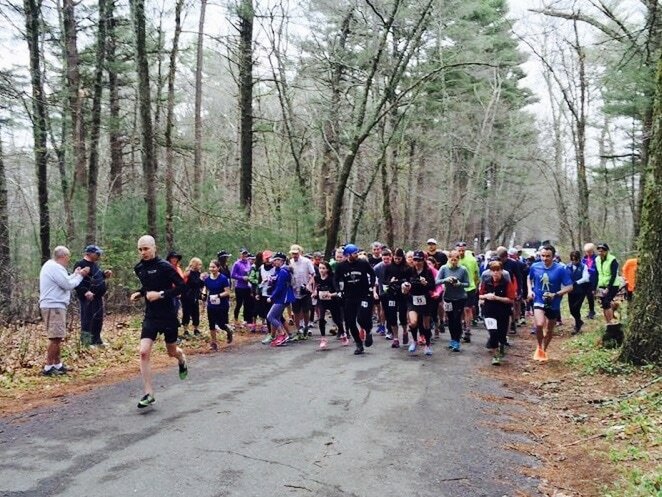 Fifty runners toed the starting line of the Big A 50K and took on three loops of all-terrain vehicle and singletrack trails of the Mount Agamenticus Conservation Area on Saturday, May 6, in York, Maine. Nineteen of those runners completed the race, including the fastest male and female runners who both hailed from Massachusetts. Caron, 20, led wire-to-wire. He built a four-minute lead on Teddy Lyman, 22, of Beverly, Mass., during the first loop and then quickly opened a sizeable lead en route to the overall victory and a new course-record of 4:48. HUUUUGE congrats to Young Patrick who added "successful race director" to his insanely long list of running-related accomplishments. The Boston Bulldogs Run for Recovery raised money for the Boston Bulldogs, a running club that strives "to provide an anonymous and safe community of support for all those adversely affected by addiction - those in recovery, their families and friends, the clinical community and the community at large." YP is a volunteer coach for the Bulldogs. It was a mixed bag at the Boston Marathon for the MiniPonies. YP had a phenomenal run busting in at 2:40. He was definitely comin' in hot! 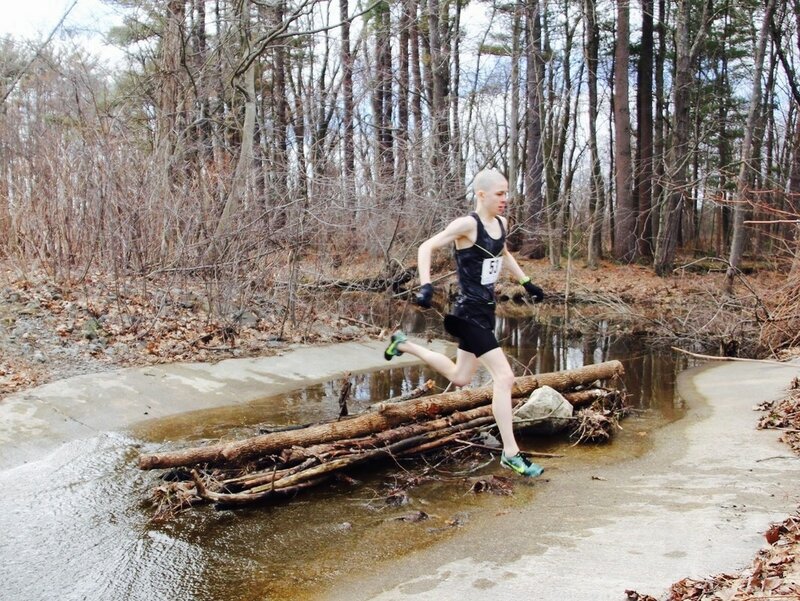 The week before Boston a few MiniPonies tackled the NETT favorite Merrimack River Trail Race. YP took 3rd overall and set an age group record in 1:00, while Crazy Dave and Eri took a leisurely (as leisurely as you can on that course!) run together and covered a lot of ground (conversationally, that is). 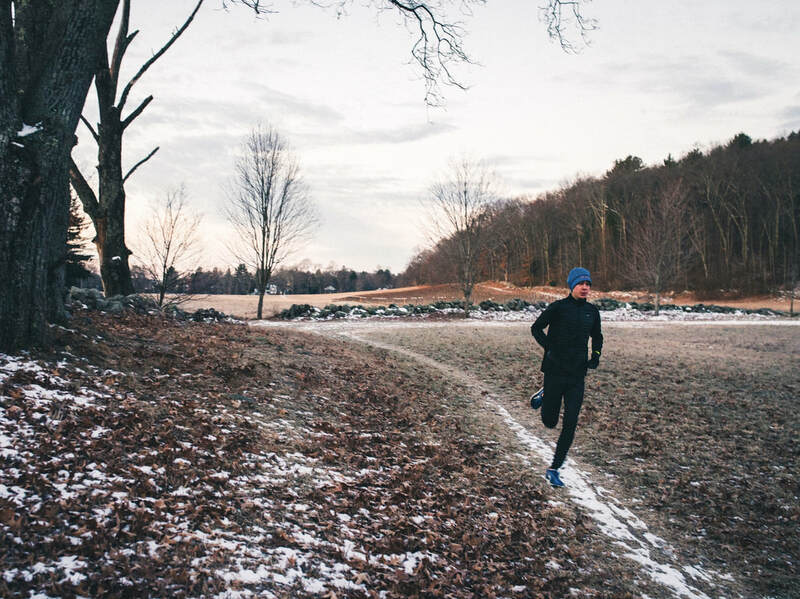 "The Goat Hill 50K made its debut in 2016, and the new event gained some notoriety as young Patrick Caron of Needham, Mass., raced to victory in one of his numerous ultramarathon wins for the year. Caron returned for year two, and the 19-year-old brought an even stronger effort in his bid to defend his crown. A two-person race unfolded right from the start as Caron and Nephew quickly distanced themselves from the pack. Caron darted to about a 20-yard lead before reaching “The Goat” and beginning the ascent. Nephew hung tough and stayed within striking distance for much of the first loop, but Caron held a 58-second advantage after the first eight miles. 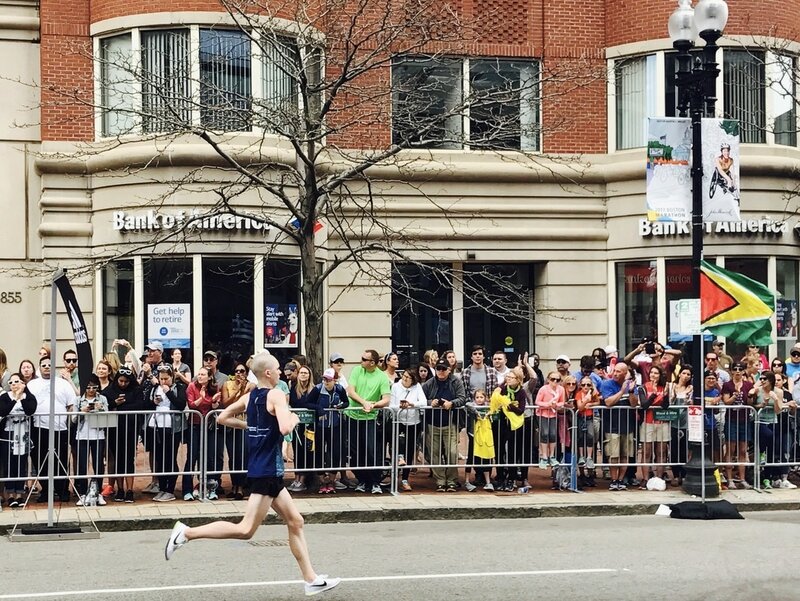 The lead gradually grew during the second loop, and Caron built a four-minute lead by the race’s midpoint..."
NEEDHAM, MA — Whether you're in the elite group, or crossing at a slow clip near the end of the day, it's a huge accomplishment to complete the Boston Marathon. On Monday, April 17, over 30,000 runners took off from Hopkinton and traveled 26.2 miles to Boston. Patrick Caron was the first Needham runner to complete the race, crossing the finish line at 2:40:45. Race day conditions were typical with temps in the low 40s and a steady wind of at least 10 mph. The wind seemed to be mostly a cross-breeze which felt like a head-wind in BOTH directions! Caron’s winning time of 6:23:03 was a 25-minute improvement from 2015, and it was the second-fastest in course history. Are you looking for a new podcast for your weekend long run while burning off a few extra Thanksgiving calories? Two recent ultrarunning-related podcasts featured interviews with people with Massachusetts ties. The first podcast has been available for a few weeks. 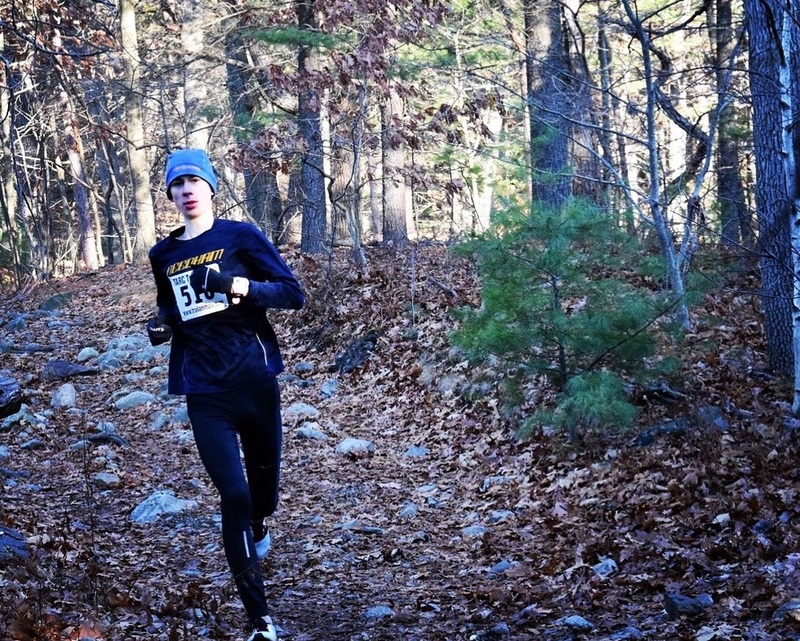 Originally published on Nov. 2, Elevation Trail host Gary David, a resident of Stow, Mass., interviewed Patrick Caron, the 19-year-old phenom from Needham, Mass., who has taken the in-state and regional ultrarunning scene by storm since making his debut at the 2015 TARC Fall Classic. 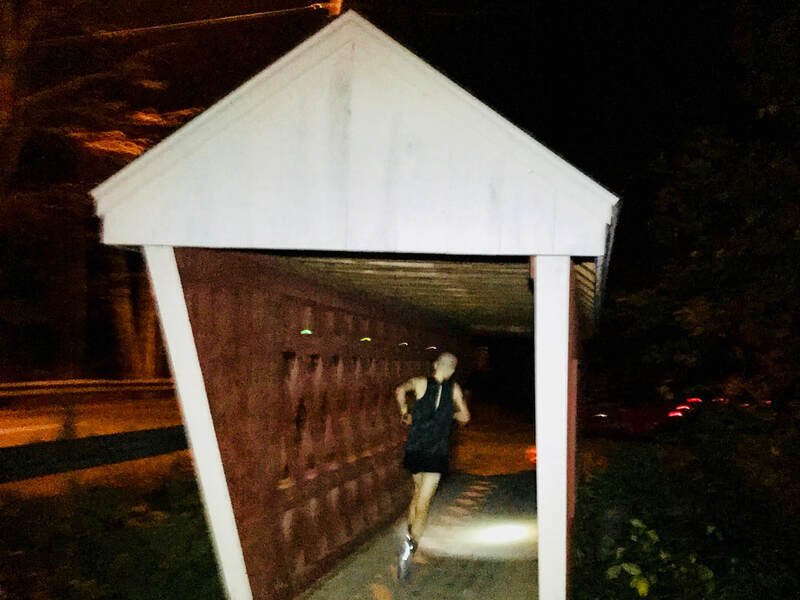 BROOKLINE, N.H. – The faint glow of a flashlight beam shook in the distance with each smooth, deliberate swing of Patrick Caron’s left arm... Caron said he had three goals for the race: finish in less than 15 hours, set a new course record, and win the race. The 19-year-old resident of Needham, Mass., accomplished all three. Most 19 year olds are more concerned with finding people to buy beer for them than finding the next ultra to run. 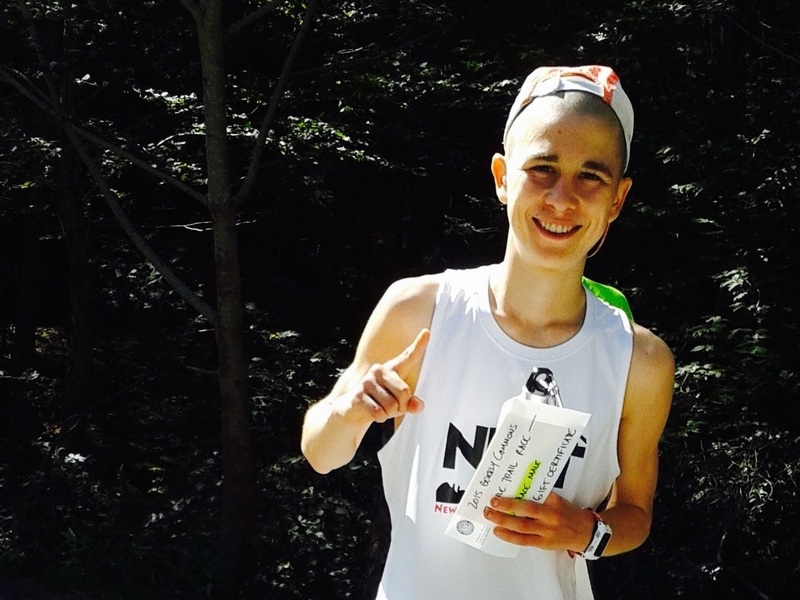 On this edition of Elevation Trail, Gary talks with Patrick Caron, a New England kid who would rather be on the trails than go to a party. We’ll find out why he has chosen to run every day, race every weekend, why he didn’t have a high school graduation party, and how sustainable is his race schedule. 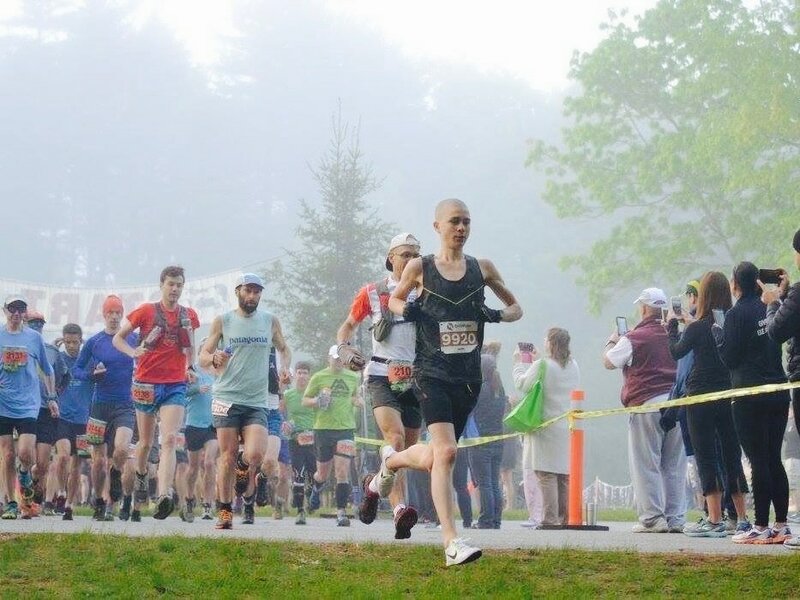 We’ll also talk about his 14:51 effort at the Ghost Train 100 mile ultra, his second place at the Eastern States 100, why Ian Sharman hasn’t talked to him, and the dangers of running with bacon. The odds-on favorite to log the most miles was 19-year-old Patrick Caron. The Needham, Mass., native signed up for the event at the last minute and arrived at the starting line moments before the race began. He promptly took the lead within seconds of the race starting, and never relinquished the pole position. John Paul Lewicke, 31, of Arlington, Mass., and Sylvain Olier, 41, of Andover, Mass., gave chase and stayed within close contact of Caron for the first few loops, but they were unable to reel him in. 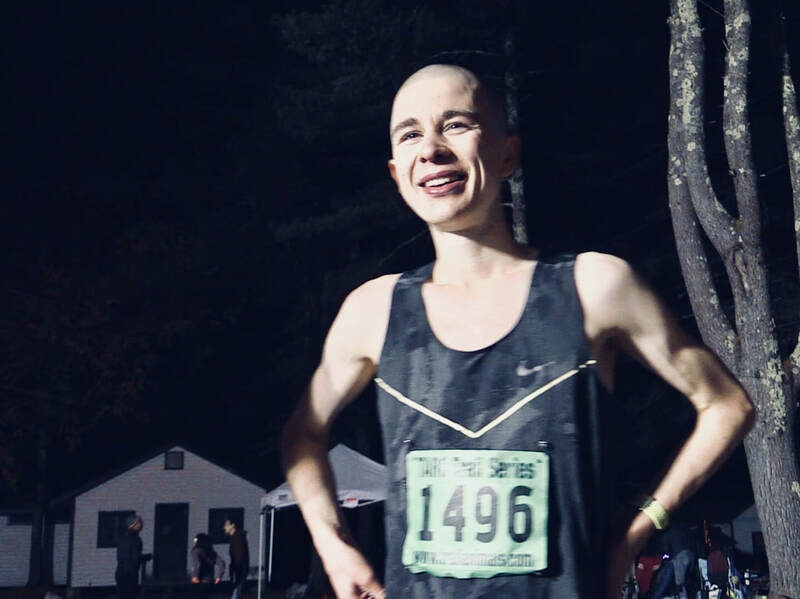 The 19-year-old from Needham, Mass., hammered all five loops of the course Saturday, Sept. 10, at Great Brook Farm State Park in Carlisle, Mass., and obliterated the course record in a blistering time of 7:05:41. Caron’s performance was well more than an hour faster than his time from 2015, and he surpassed Hanscomb Air Force Base resident Billy Preston’s old course standard by 47 minutes. Caron now owns two of the top three times for the 50-mile distance at the Fall Classic. 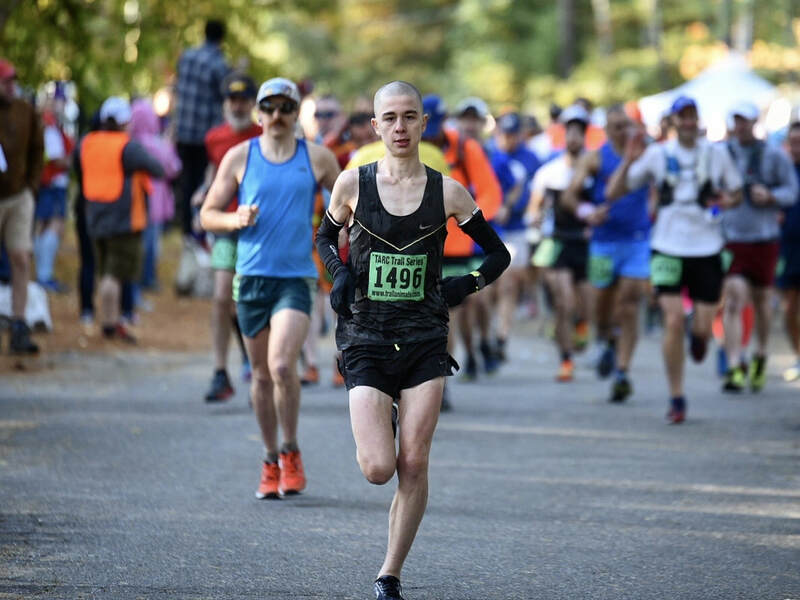 Patrick Caron has been running ultramarathons for just shy of a year, and he has quickly made his presence felt on the trails of New England. 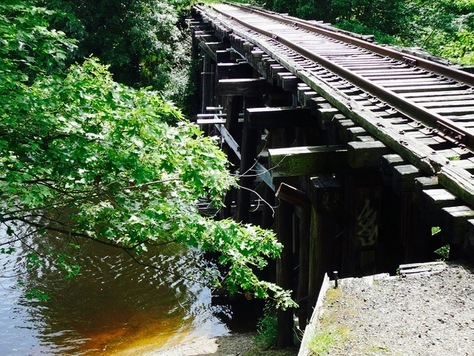 For his 100-mile debut, however, he traveled to the Rust Belt to take on the rugged trails of north-central Pennsylvania at Little Pine State Park in Waterville. 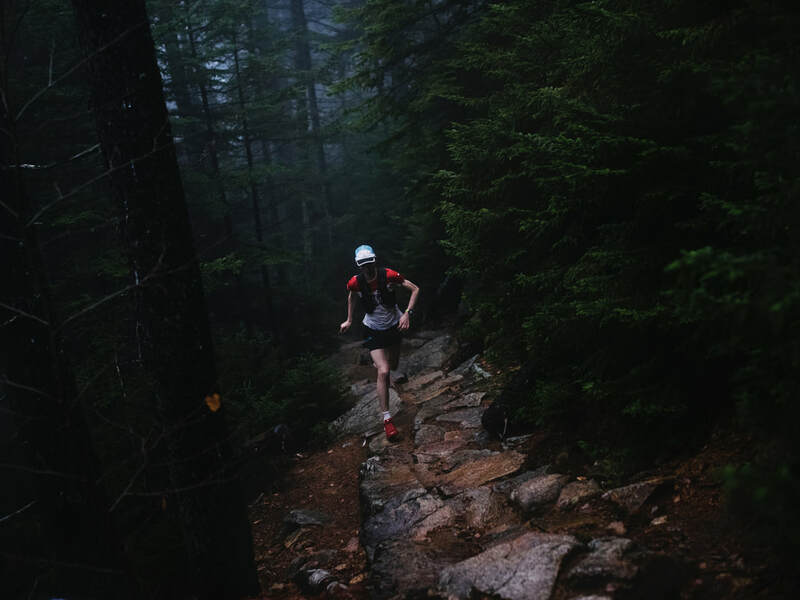 Rather than choosing more friendly terrain for his first 100, Caron elected to tackle the Eastern States 100 on course that is equal parts gorgeous and grueling with its stunning scenery and 19,000-plus feet of vertical gain. 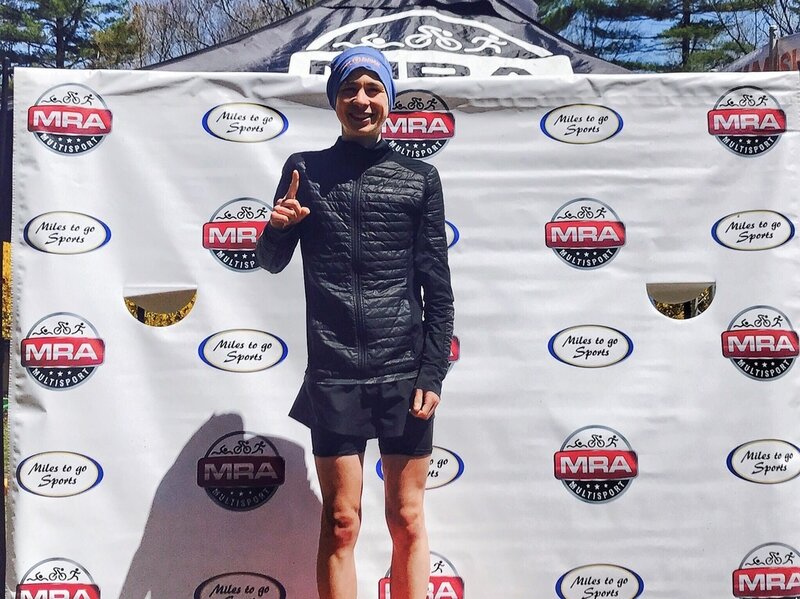 With six ultra victories to his credit just this year, the 19-year-old from Needham, Mass., entered the race expecting to compete for the victory. He raced that way, too. 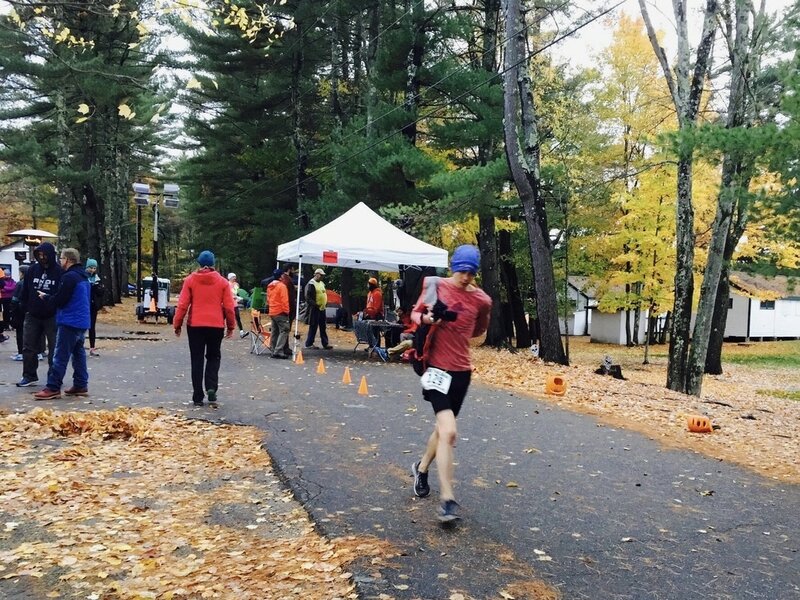 Patrick Caron won...that's right, WON the Pineland Farms 50 miler this year. He said of the day, "The trails up there are awesome!" He bested his closest competition by a full 11 minutes in 6:14:31! The state’s presence was particularly strong in the 50-mile race where four of the top seven finishers hailed from Massachusetts. None were faster than Patrick Caron. 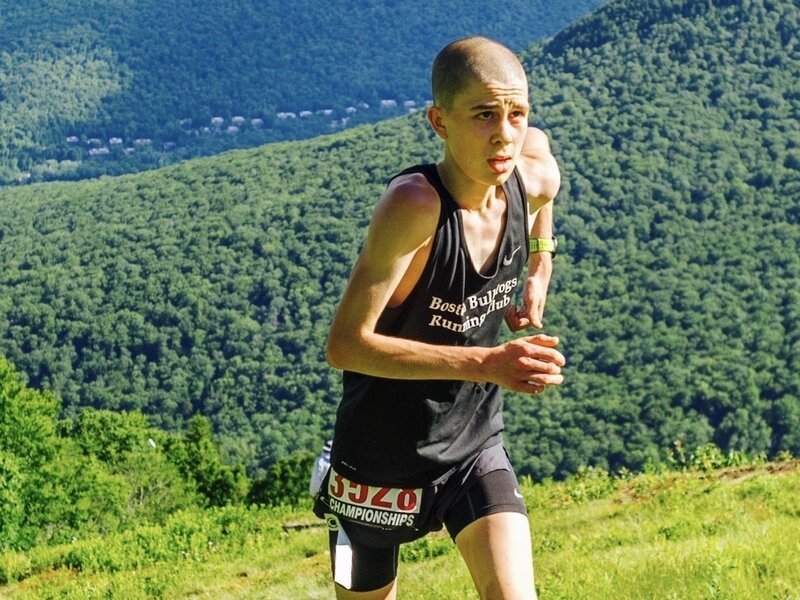 Caron, a 19-year-old from Needham, Mass., continued his assault on the top position at ultramarathons this year, notching his third victory in four tries. 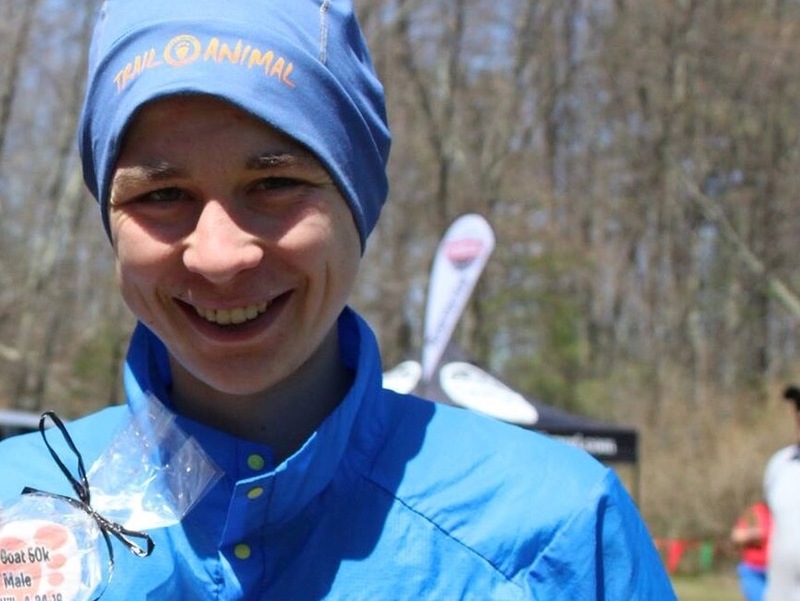 ​After placing second overall at the TARC “To Hale and Back” 6-Hour Race in March, Caron rattled off first-place finishes at the Goat Hill 50K in April and the G.A.C. Mother’s Day 6-Hour Run in May. On Sunday, Caron again claimed victory. His winning time at Pineland Farms was 6:14:31, more than 11 minutes ahead of any other competitor. Patrick Caron chalked up another strong ultramarathon performance on Sunday, May 8, at the G.A.C. Mother’s Day 6-Hour Run in Topsfield, Mass. Caron took his speed and endurance to another level as he logged 47 miles in six hours to take top honors at the race, which took place on a three-mile loop course. 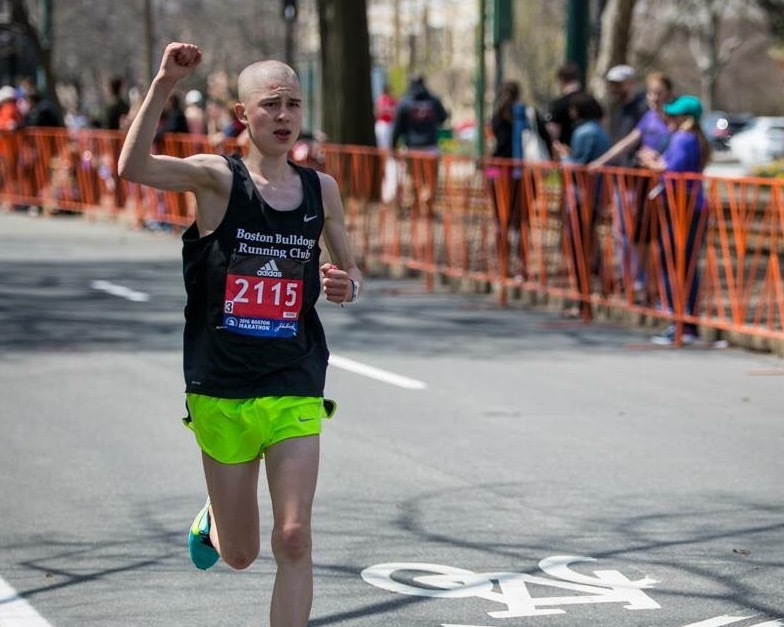 18-year-old Needham resident Patrick Caron ran his first Boston Marathon in 2:46:59 and raised over $3,000 for The Boston Bulldogs Running Club. 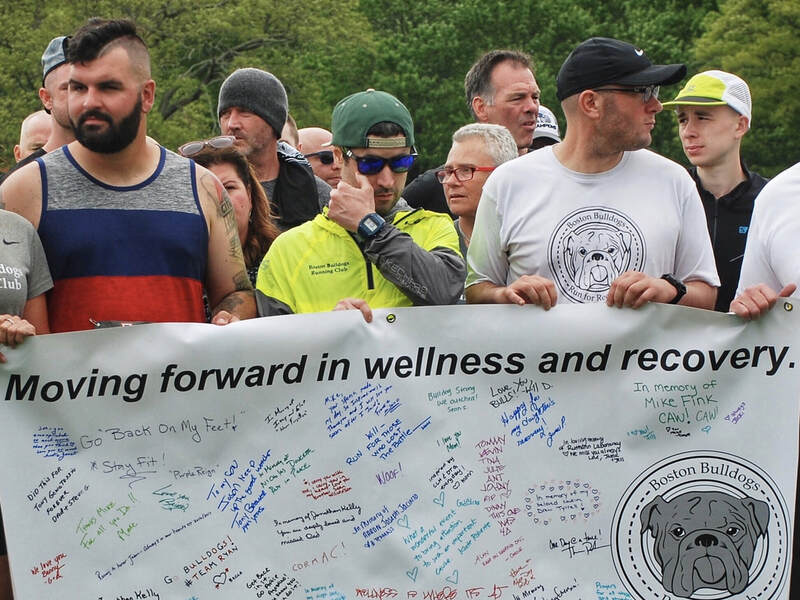 The Bulldogs is a co-ed 501(c)3 non-profit running club established to reach out to all those who are adversely affected by addiction - those who are battling addiction and in recovery, their friends and families, the clinical community, and the community at large. The Club is a community of support encouraging the physical, emotional and social benefits of running and wellness. ..the 19-year-old has accumulated quite the impressive resume in a short period of time. 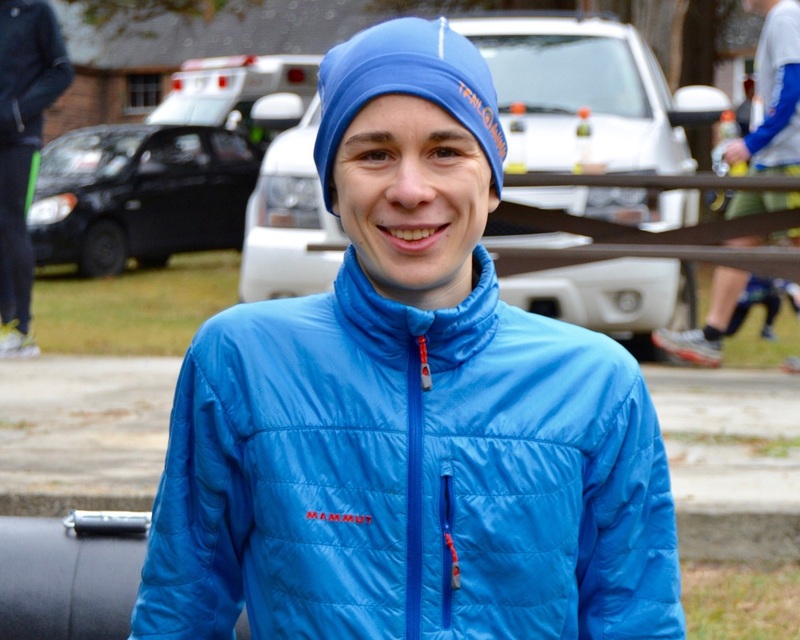 Caron, of Needham, Mass., earned a runner-up finish at the TARC Fall Classic in September 2015, and he followed it up with a victory at the TARC Fells Trail Winter Ultra 40-miler in December. Caron then opened 2016 with a runner-up finish with 38.5 miles at the TARC To Hale and Back 6-Hour race in March. 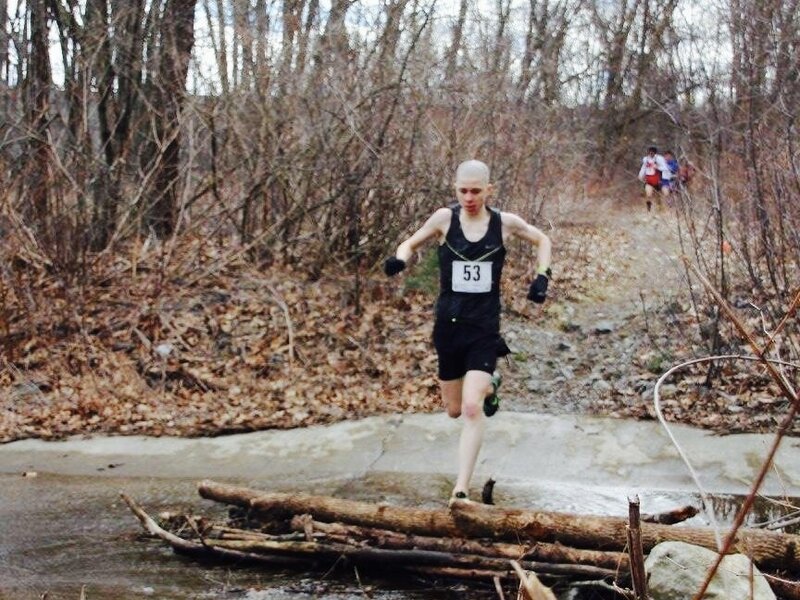 On Saturday, April 24, Caron collected his first ultra victory of 2016 at the Goat Hill 50K in Uxbridge, Mass., as part of the durtyfeets Trail Series. Caron covered all four loops of the course in a speedy 4:34:03 and secured the victory by a large margin. On Monday, April 18, over 30,000 runners took off from Hopkinton and traveled 26.2 miles to Boston. Patrick Caron was the first Needham runner to complete the race, making the run in 2:46:59. For many runners the Boston Marathon is the ultimate race. But for a young man in Needham it’s part of a multi-decade commitment. “I always feel like it’s part of my daily routine. You know how some people can’t go without coffee in the morning? 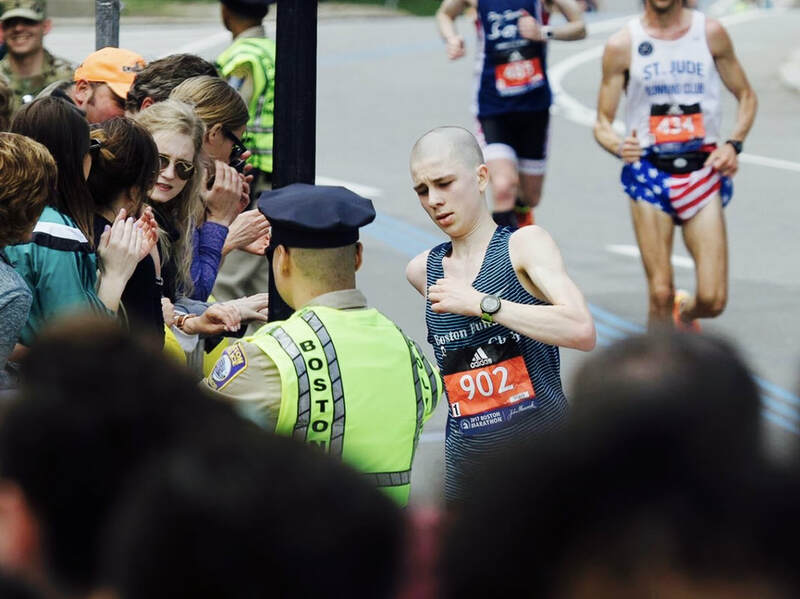 I can’t go without a run in the morning,” 18-year-old Patrick Caron told WBZ-TV. Caron is fast. His marathon pace is roughly 6 minute, 20 second miles. He’s hoping to finish Boston in under 2 hours and 45 minutes. He runs every day and wins long distance races across the country. So while Boston is a race he’s always wanted to run, Caron is hoping to make it to the top of another elite list of runners – the U.S.A. Active Running Streak List. The “streak” simply means you must run at least one mile every day to stay on the list. 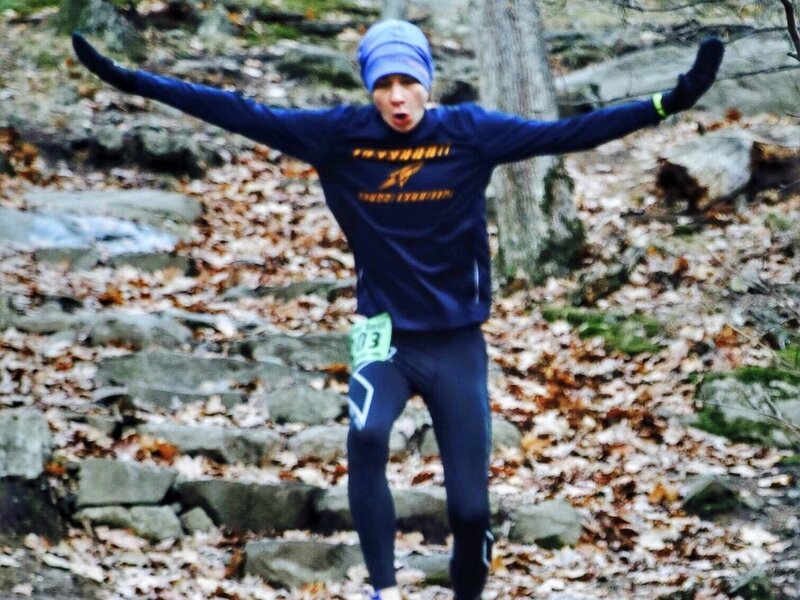 ﻿Big Congrats to Young Patrick who ran away with the 40-mile TARC Fells Trail Ultra Winter trail race last weekend. 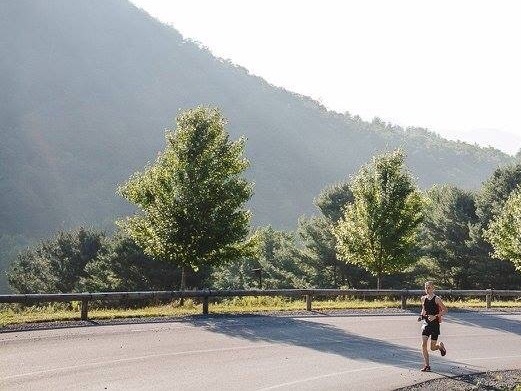 The race, which was founded by NETT's own Bogie D, does laps of the Fells Skyline trail and runners can do laps either clockwise or counterclockwise. As a result, runners don't have a great sense for what place they might be in during the race. YP said he wasn't sure how close he was to second place. Well, it turns out he had a full 24 minute lead by the end of the race. 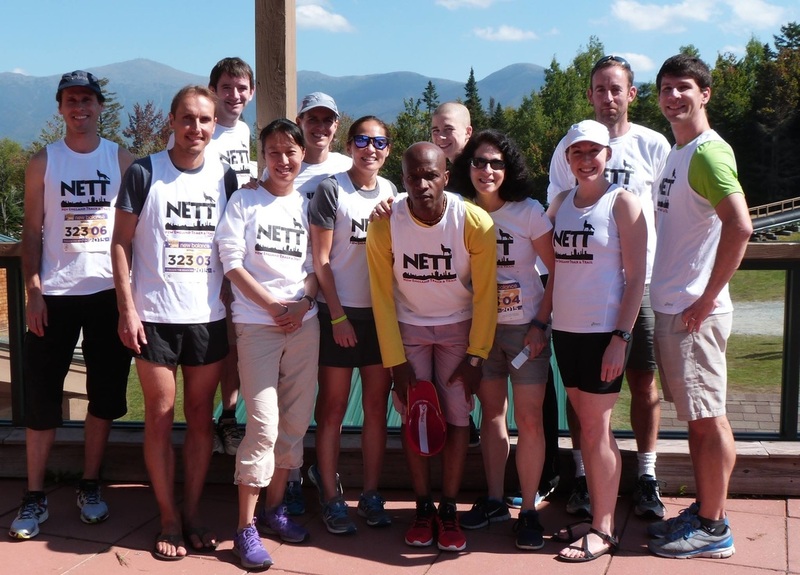 Breaking news: NETT's Wings Team finished in 10th place -- OVERALL -- at the Reach the Beach Relay this weekend. Not in their division. Not for a mixed team -- 10th place out of 500 teams, total. The team covered over 201 miles in 24:17:01 -- over mountains, down valleys, through mist and blistering heat. Memorable in every way. Challenging, fun trail run through the amazing woods in Beverly Commons Conservation Area. Plenty of hills and exciting terrain! Patrick came in second overall (and first in his age group) in a close duel with the eventual winner... Both guys ran tough races and showed a lot of mettle. The weather was perfect and the race well run by the Greenbelt folks. 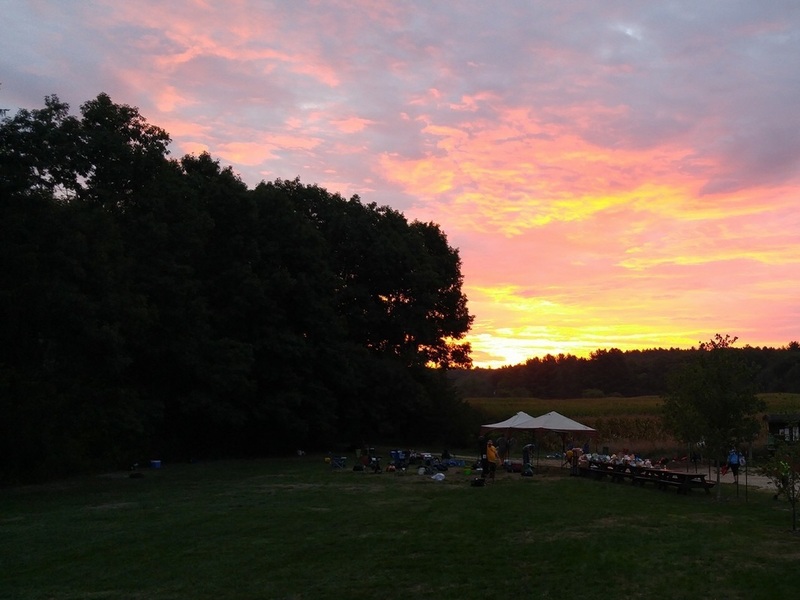 Participants from as far as New York and New Hampshire challenged themselves in the spirit of camperships on Saturday, June 13, at Hale Reservation. Nearly 100 participants braved Hale’s Obstacle Challenge 5K course around Noanet Pond by crab-walking over rocks, hurdling over canoes, avoiding dodge-balls and having an all-around great time doing it... At the awards ceremony on North Beach following the race, the following individuals were honored for having the best overall race times: Erin Colleran, Molly McLaughlin and Gregory Campion, all of Westwood; Patrick Caron of Needham; Alex Agudelo of Arlington; and Molly Gile of Dover, N.H.
...Patrick spent countless hours putting together a project on the crowdfunding website Kickstarter to raise the remaining $15,000 needed to begin work on the trail (Bay Colony Rail Trail). After interviewing several members of the association, attending monthly meetings, and filming scenes out on the trail, Patrick launched the Kickstarter project in the spring of 2014, and it was a huge success! By the end of the campaign, 229 people from all over the state (and country!) had donated a whopping total of $20,021, far surpassing the original goal. 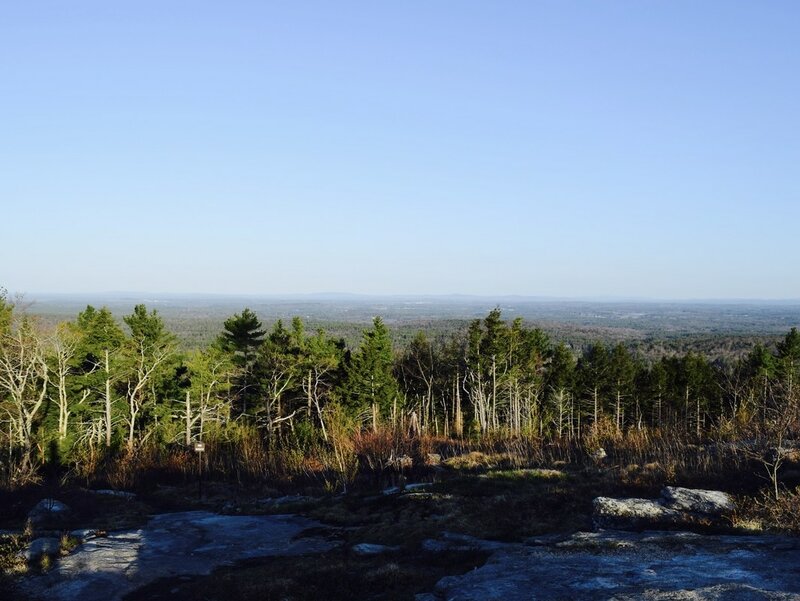 Recently, Patrick has created a club at Needham High School that will be a key part of the Trail Stewardship Program, a group of volunteers who will keep the trail clean and usable. 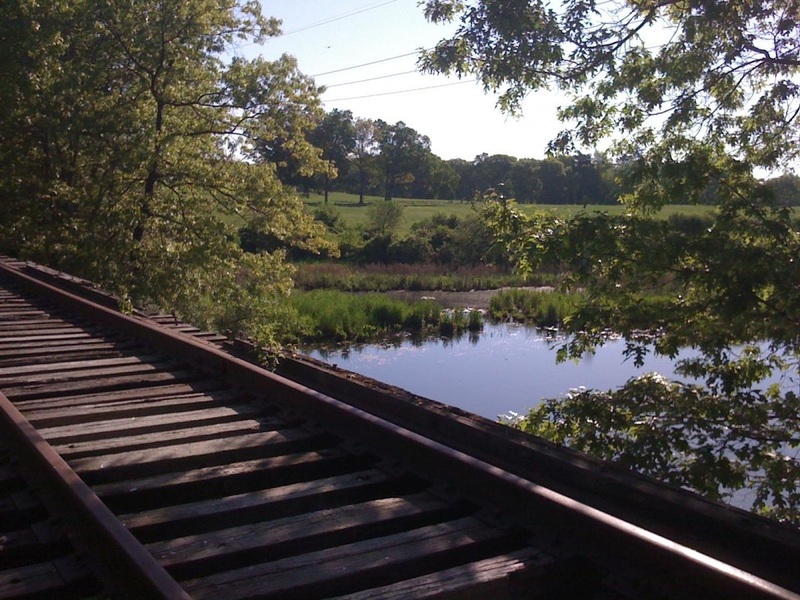 NHS Junior, Patrick Caron, has put together a Kickstarter campaign for the rail trail. This was a heroic effort: Patrick initiated the effort, did the filming, solicited support from BCRTA, and navigated the Kickstarter process. We’re hoping that Patrick’s initiative will close the final $15,000 needed to achieve our target for these first phases. If you are willing to help, donations on Kickstarter begin at $1, though $40 will get you this year’s edition of the BCRT t-short, which is a harvest gold. The Kickstarter campaign is here.